I love experimenting with cauliflower, so when I stumbled across this recipe from Delighted Momma's blog I had to try it out. The flavor was awesome, & I loved her recipe (I seriously ate almost an entire batch!). However, I had a little trouble with the biscuits sticking to the muffin tin, no matter how much coconut oil spray I used, so I decided to revise it. I added in some spices & "extras" to jazz them up, plus devised a plan to ax the muffin tin (with the help of my mom!). Cauliflower is super low in calories, yet contains several health-benefiting antioxidants and vitamins. It's low in all the bad stuff, & high in fiber, calcium, iron, and potassium (just to name a few). It also has a very mild taste if you cook it properly; making it a perfect substitute for flour & starches. With a 1/4 cup measuring cup, scoop the mixture onto a baking sheet lined with parchment paper. I tap the cup down firmly onto the sheet to make sure it all comes out & keeps a good shape. LOVE these!! These are so super good! My new favorite side-dish. - even though I could probably eat the whole batch for a meal 😉 And even though I Hate cleaning up the food processor, this recipe is totally worth it. Looks like I have chef competition in the family! I'd rather rinse a food processor than scrub that dang muffin tin! & have a meltdown after all my biscuits get torn apart! ;) haha. I'm glad you like 'em Mom, & thanks for helping me make them easier! Another option instead of almond flour? I found these on pinterest. OMG they sound heavenly. I will try them. Thank you so much for sharing your healthy recipe. Going to make these this weekend!! What dish would you serve with them? I usually serve them with something simple like meat & broccoli~ however you would serve typical biscuits! They go well with anything though. :) Thanks for commenting & I would love to hear how they turn out! If I don't buy Trader Joe's bagged cauliflower, would that be equivalent to one head? two? So yummy! Thanks for the recipe! Even my 16 year old loves them. That's awesome! So glad to hear that :) I'm happy to share. OMG these were amazing!!! Thank you for your hard work in creating these. I plan on whipping these up again and again!! I did add an extra Jalapeno cause we like things spicy. I also shredded one large cauliflower but realized it was way to much so I only cooked/used half. Next time I will only shred half of a head of cauliflower. It yielded 8 pieces. These look so delicious !!! Love the ingredients in this recipe. Was wondering if I could use arrowroot flour to replace the almond flour? Im curious about how many muffins this recipe makes? I am trying to plan ahead for party! These look great and I am excited to make them! I wonder if I could do everything, except bake them? I could save it in a bowl in the 'frig and just bake a few at a time during the week. Do you think that would work? Or would it get to soggy? How many biscuits can you eat with a meal? Are they unlimited? Thanks. @pmac The biscuits are full of veggies, so I would go ahead & eat as many as you would like.. just eat till you're full. Hope you like 'em! Do you just add the cauliflower to the food processer from the bag, raw? no steaming beforehand? One more question! I am using turkey bacon, any ideas on how many strips to cook to get 1/3 cup? These are great! I am eating mine now! I skipped bacon and jalepeno (no bacon and we don't like spicy) and put about a cup of leftover holiday ham. Delish!! When I run out of ham...I plan to use chicken sausage. Love recipes with cauliflower! Thanks! Do you have the nutritional values and serving size for this? Since I don't have a food processor, would "mashing" the cauliflower work, i.e. steam the cauliflower and then use a mixer to "mash" into faux mashed potatoes? If not, what would you recommend? I tried this the first time 2 weeks ago as per your ingredients. I thought they were really good. Last week I added some chopped onions... They came out delicious... taste like eating homemade potato pancakes. One of my neighbors dropped by last week and I gave her a few and they loved it so I dropped off your recipe to her. Today I went to make it again and came to print your recipe out again. I think this time we are going to place the mixture in a pyrex baking dish and bake it like we use to bake potato pie for the holidays. I will let you know how it turns out. But we are keeping with your same ingredients just adding onions to the mix. would this work with Bisquick? Made these for our Valentines dinner and loved them. Used regular flour because that's what I had. Highly recommend making this. These are so amazing. 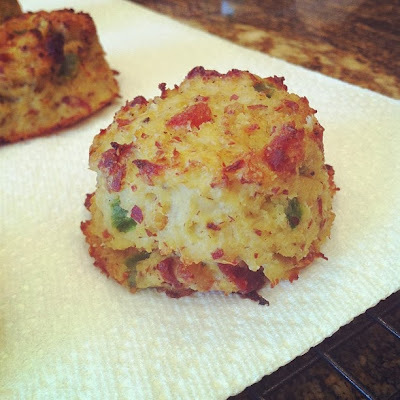 I added sun dried tomato and onion powder and they are so delicious!! Thank you for the recipe. I have these in the oven now and I am super excited to try them! However, for some reason when I scooped them out and put them on the baking try my egg ran out of a few of them....do you know what I did wrong? Thanks! What did you use to bake them on/with, instead of the muffin tin, a cookie sheet? I guess if they are not too battery/gooey, you could use a cookie sheet? Do you know how many calories in each? Hi guys! I am not sure about the calories, but I will do the calculations soon & be sure to post them beneath the recipe. The calories are very few though- since they're mostly cauliflower! & Yes, I use a cookie sheet or "baking sheet" for mine! These are great! Do you find the consistency is a bit more like a potato cake, or even a polenta cake? I'm not sure if mine were moister than usual. They are tastey, but definitely not as light and fluffy as a traditional biscuit! Hi Christina! Yes, I'd say that's a good way to describe them-- sort of a potato cake texture! If you want to make them a little more dry, you can try squeezing out the mixture in paper towels before you scoop them into biscuits & bake :) So glad you enjoyed them though! We cooked the cauliflower in the leftover bacon grease and added green onion. We love these! Thanks for the recipe and the tips to shred. You are very welcome Mary Beth! 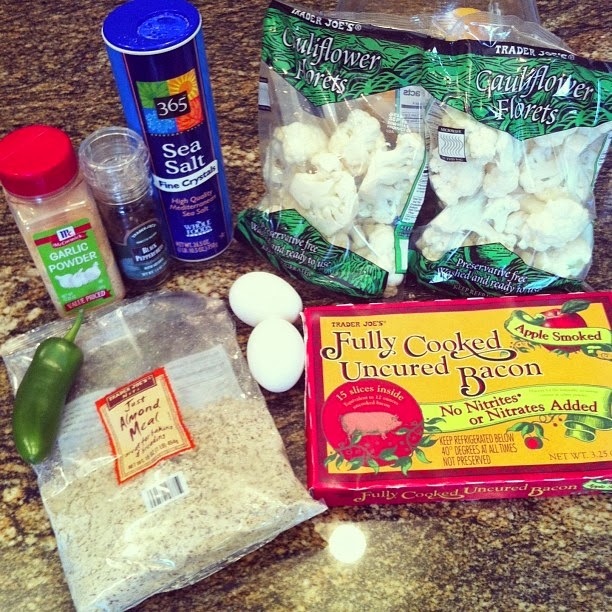 Great idea to cook in the bacon fat, and love the green onion idea! I will try that! I made these tonight and they were nothing short of spectacular! I did not add the bacon or the jalapeño only because of the meal I was serving them with. Thank you for sharing this wonderful recipe! These look and sound delightful! Printed it out to try soon! Very rarely do I comment on online recipes I try just because the majority end up being good, but nothing too special. But THESE! OMG. I didn't think they tasted like biscuits to be honest but I did think they were just like gigantic tater tots which is even better because I could eat tater tots all day... but don't because obviously that is a very bad choice lol. I am planning on making these again but with a tablespoon as a scooper. SO delicious. Thank you for the recipe!! Lisa, thank you for the positive feedback! I'm so glad you enjoyed them! & Sorry for the delayed response! Buttoni~ Let me know if you do try them out! I think you will love them! Grace~ I LOVE your giant tater tot comment, so true! haha, I couldn't agree more. 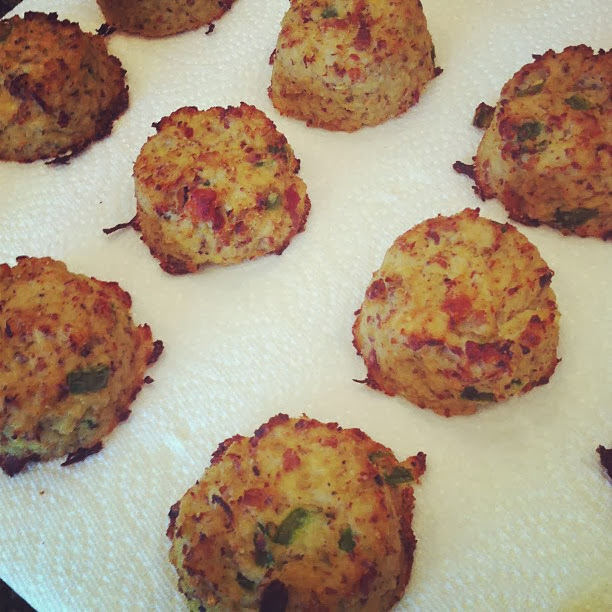 I have a "Paleo Pizza Bites" recipe that is similar to this one, which uses a tablespoon scoop. I think you would really like those if you enjoyed the "biscuits"! :) Thanks again for your nice message! I imagine you are probably sick of hearing it :) but these are so very delish. I make them all time now. I believe they are about 60 calories each. Thank you for this great recipe. Do you know how many cups of shredded cauliflower it makes? I forgot to measure how much I had before I shredded! ! Diane~ Thank you so much for your sweet words~ never gets old to hear about someone enjoying my recipe! & Big thanks for sharing the calorie info... I know lots of readers would like to see that! Have you ever done it with frozen cauliflower? I keep a ton of that on hand so I can make whatever whenever. I also have way more freezer than fridge space. 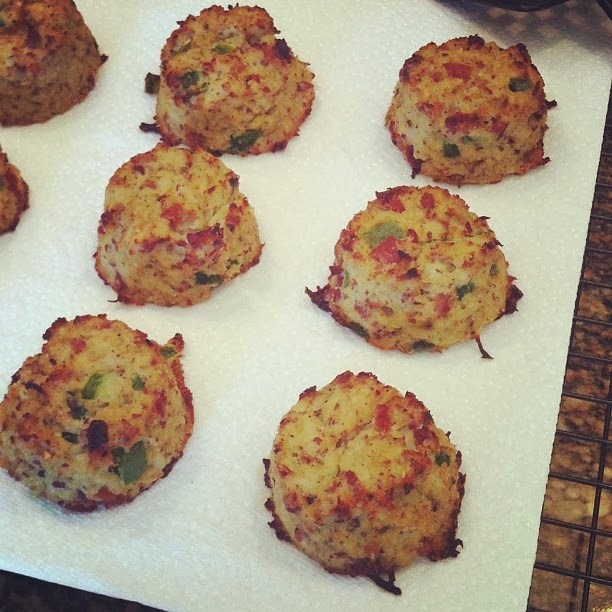 Also, I see the potential for crab cakes here, and I am craving some in the worst way. I was wondering if I can use coconut flower instead. Hi Luciana! Yes, any type of flour will work fine for this recipe. :) Enjoy! Awesome, as I have tree nut allergies and bake with exclusively coconut flour! I used corn meal and these turned so amazing! I made biscuits and gravy with the left overs that was even better! These were really good. I cheated yurt a tad and put a tiny pad of organic butter on top. O. M. G. Yummy. I made these and we loved them. For left over lunch, I added a fresh tomato slice and some roasted turkey on top. 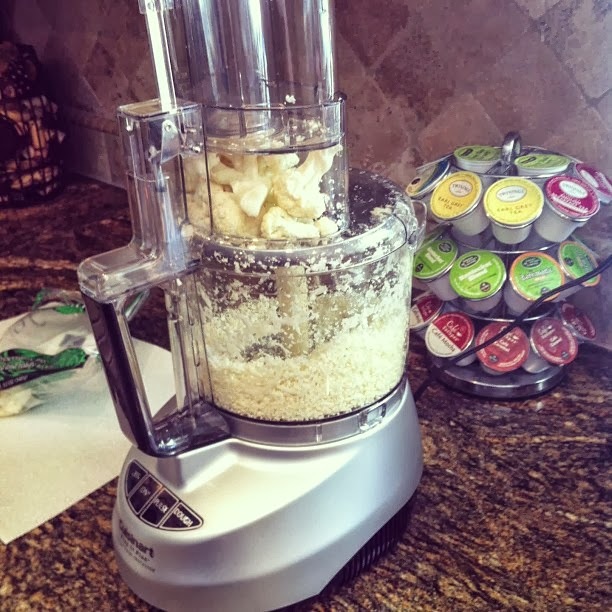 can this be done without a food processor? I have a party to go to tomorrow and think these would be a great appetizer, but I think the size might be a little big for "finger food". Would it work making 24 bite sized balls versus the "biscuit" size? I imagine I might just need to bake for a bit less time? I calculated that each biscuit has 83 calories if you use coconut flour. A little more calories for each if you use aloud flour. I calculated that each biscuit has 83 calories if you use coconut flour. A little more calories for each if you use almond flour. Made these - by request - for a friend who just had a baby. We are not big cauliflower fans in my house, and this was my first paleo recipe ... these things are AWESOME!!!! Made these today, they are amazing!!! My husband who doesn't like cauliflower loved them too :). They were a whole family hit! Dolores & Julie~ what a compliment coming from non-cauliflower-fans. :) Thanks for taking the time to comment! I'm so glad you enjoyed the recipe. Has anyone made these with an egg replacer like chia seeds or Bob's Red Mill replacement powder? Would love to hear feedback rather than guessing and ruining a batch of food. Thanks! What can I substitute for egg? A friend of mine said these are heavenly and shared your recipe and your site. Wow, I'm in heaven! I am going to try these soon. They look heavenly. Cauliflower is my favorite vegetable. Hi, Jess. Thanks for the recipe. I tried it this morning with stellar results! Easy, beautiful, tasty as hell. As an ex professional chef and restaurant owner it started my mind clicking away and I wanted to return the favor of this recipe with some variations. Cauliflower with chopped shrimp instead of bacon will drive you out of your mind. Or curried with chopped, cooked chicken, coconut cream and coconut flour. Also, I don't eat nuts, so I used arrowroot flour and a little coconut flour instead and they worked well. I think next time I'll add a bit more coconut flour just because I think I'd like them a little drier in the center. Overall...really good work. I'd have hired you! Hi Jess ! Got this recipe from your pin on pinterest and LOVE it !!! I even brought the ingredients with me when we went on vacation in FL ! They are a great snack warm or cold. THANK YOU for sharing. These are absolutely delicious! I've made them 4 times already. I adjust the recipe a bit depending on what I have on hand and they always come out wonderfully. One thing I always add is caramelized onions. Just because who doesn't love caramelized onions! 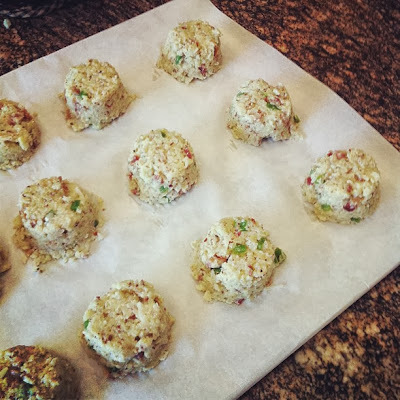 I've made them vegetarian, added some different finely chopped veggies...you can make all manner of adjustments and as long as you keep the proper quantity of cauliflower, egg and almond flour you can customize all sorts of ways. I love them! 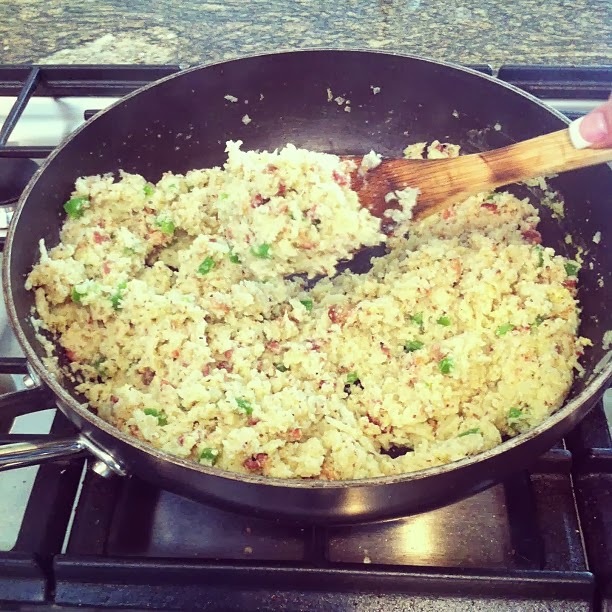 Has anyone attempted using frozen cauliflower rice? Does this work well?? My family enjoyed these, thank you. I have looked for nutritional information and cannot find it. Could you tell me the carb, fiber, and fat count?